How to play craps or shoot dice is rather easy to learn and then progress to more sophisticated methods of play. 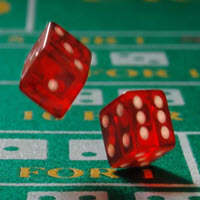 Craps is all about the number seven which on a pair of dice is made up of 3-4 or 2-5 or 1-6. The shooter or the roller of the dice makes what is called the come out roll. If the dice come up seven or eleven on that first roll, the shooter and all who bet on the pass line will win. It the roll is a 2 or a 3 or a 12, the pass line bets lose. If the roll comes up any other number that number becomes what is called the point. The pass line bet is a winner if the number repeats before a seven is rolled. If the dreaded seven comes up first then the pass line bets all lose. The first simple strategy is to take advantage of the odds offered in a craps game. A player makes their first bet on the pass line and either wins, loses or gets a point. If a point number is rolled, the player should take behind the line odds on the point. Each casino has its own rules as to what they will accept on a behind the line bet. Just ask the stick man or a dealer what their limit is and then bet it. If the table gets hot, the dice will roll many numbers and few untimely sevens. A really hot table will also roll many hard way numbers like four, six, eight and ten. These are called hardways, as the dice are pairs of twos, threes, fours or fives. A table of dice payoffs is the next thing that a player should learn as this is where the money is made when a dice table gets hot. (these payoff numbers can be obtained on the Internet or on many online casino sites) When a table is showering the players with numbers, the player should be making all of these number bets at odds. These bets can be of two types, all day bets and single roll bets. All day bets stay up in play until a seven is rolled. A single roll bet either wins or loses on the next roll. The better bet unless the player has a strong hunch is the all day bet. If a player knew nothing about craps except to bet the pass line and take the max behind the line bet on all points, then they would play better than most craps players. When a player adds to this betting on the come line and placing bets, they have most of the reasonable bets covered that the craps table offers to a player. The rule in craps is to push the devil out of a hot table and parlay bets, take the odds and keep all of the number bets covered until the table cools down. More money can be made on a hot craps table faster than any other casino game. Players who know how to play craps make a killing when they find a hot table. The secret to recognizing a hot table early is each shooter holds the dice for a number of passes. Certain shooters hold the dice for much longer than normal and throw many numbers in a row before making their point. Hardways become common and all of this is going on without many sevens being rolled. The lack of sevens is another clue that the table is moving in favor of the craps players. Be alert to these runs of numbers and which shooters seem to be lucky. Then make the bets and watch your stack grow as the table goes from warn to hot.